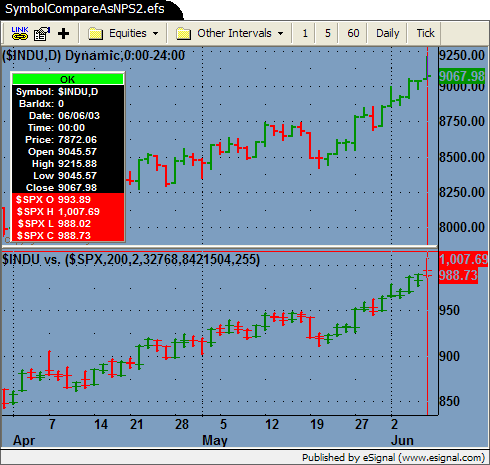 Compare a symbol to your chart symbol as a non-price study with H/L bars. Symbol: Any valid symbol (Spread symbols are not valid for this formula). Bar Thickness: Default is 2. Controls the thickness of the H/L bars. Up Bar Color: Default is green. Neutral Bar Color: Default is grey. Down Bar Color: Default is red. After applying the formula, go to "Edit Studies" and enter a symbol. The formula also draws the high/Low bars and the open, similar to a bar chart. Requires eSignal version 7.9 or later. between symbols that have different trading hours.